The Arp2/3 complex is composed of 7 evolutionarily conserved subunits (Arp2, Arp3, ARPC1-C5) that are structurally similar to the barbed end of actin . The complex is inherently inactive, however once activated it facilitates the nucleation of actin monomers from existing filaments as new branches or daughter filaments (reviewed in ). Video. 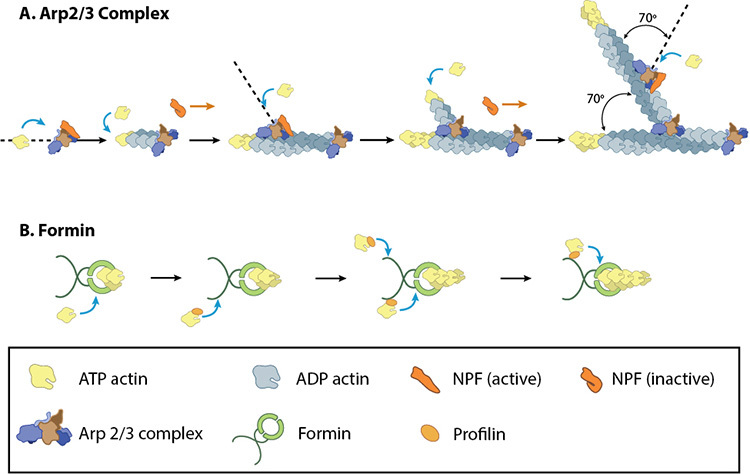 Arp2/3 complex mediated actin nucleation: Updated March 2013: Arp2/3 is a protein complex of seven subunits that is involved in the nucleation and assembly of branched actin filaments. The Arp2/3 complex is highly conserved and is found in most eukaryotes. Branched nucleation by the Arp2/3 complex requires a preformed actin filament and is regulated by proteins such as WASp and Cdc42 which are depicted in this animation using stylized schematic models. The Arp2/3 complex is essential in the formation of lamellipodia, where it facilitates nucleation exclusively at the leading edge (as opposed to regions further away from the front). Although it is absent from the shafts of filopodia , it is known to play a critical role in initiation and growth of these structures . Conversely, the Arp2/3 complex is present along the length of shafts of invadopodia. It has also been detected at the base of invadopodia, whilst being absent from the tips . Arp2/3 complex initiates a new branched filament by binding to the side of the mother filament and recruiting actin monomers. Components of the Arp2/3 complex remain at the pointed end of the filament (Figure adapted from ). The Arp2/3 complex binds to the sides and pointed ends of pre-existing actin filaments , in a step which contributes to its activation . Binding to *nucleation promotion factors (NPFs) occurs via central/acidic (CA) sequences and is also essential in the activation of the Arp2/3 complex. Generally, cells contain a large number of inactive NPFs. Stimuli such as chemoattractants influence signaling pathways to regulate the local concentration of active NPFs near the cell membrane  (reviewed in ). A variety of proteins engaged in these signaling pathways are able to regulate NPF activation, such as the Rho GTPase Cdc42, which regulates the NPFs WAVE and WASp. Alternatively, NPFs can be auto-regulated by intramolecular interactions between the WCA (WASP homology 2-Connector-Acidic) and other upstream domains of the NPF, as is the case with WASp and N-WASp . The exact mechanism of nucleation remains unclear however it is believed that all seven subunits coordinate to anchor the pointed end of the new filament at a 78° angle to the existing actin network . NPFs act to deliver actin subunits to the Arp2/3 complex at the barbed end, via binding through their WH2 domain – this serves to push the leading edge of a cell forward . 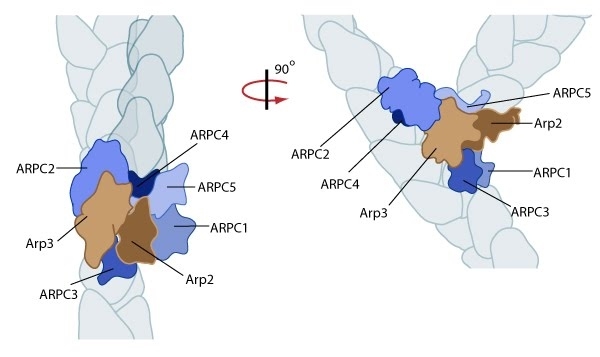 It has also been suggested that each component of the complex plays specific roles, with Arp2 and Arp3 interacting with the pointed end of the daughter filament and ARPC2 and ARPC4 binding to the original filament . Importantly, the compressive stresses placed upon actin filaments may cause them to bend and curve. This property of the actin cytoskeleton was shown to regulate Arp2/3 mediated nucleation . Here, a significantly higher frequency of filament branches were observed originating from the convex side of curved filaments compared to the concave side. This indicated that nucleation was more likely to occur if an extensional strain existed on the Arp2/3 binding surface on the filament compared to a compressional strain, which generates the concave surface . This bias of Arp2/3 towards branch formation on convex curvature was proposed to represent a mechanosensing mechanism whereby detection of filament curvature alters the local cytoskeleton in order to reinforce it against the imposing forces .